For more high power DC converters for electric cars that are fan cooled, click here. 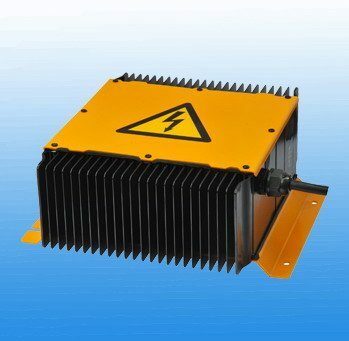 PTDC-144V/12V DC converter for electric cars use convective cooling, no fan required. Suggested Applications: Running lights, fans, wipers, electric windows, radios, stereos and charging 12 volt batteries from 144V, 196V, 240V, 288V, and 320VDC electric car batteries. These DC converters are designed specifically for electric cars and are fully isolated from both the positive and ground of the traction battery for added safety and reduction of ground-loop noise. These can handle a continuous load while charging the 12V battery and have a 12V remote-on control. Soft start technology eliminates the possibility of a voltage spike at start-up. Over-current protection, short circuit protection with automatic restart. Low voltage protection, output over-voltage protection, circuit malfunction protection. 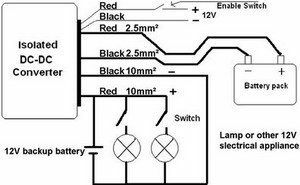 Has a similar charging action to an alternator that allows the 12V battery and load to be in parallel with no chance for overcharging the battery. 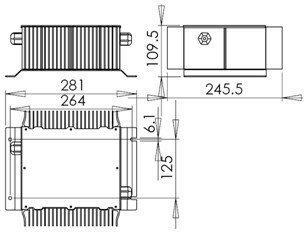 (130-190VDC for full power)* NOTE: These chargers will operate on DC input as well as AC input. They can be used with AC mains to charge a battery under "emergency" condition. For this reason the DC plus and minus terminals can be connected to either of the input terminals. It goes through a bridge rectifier inside the unit to ensure correct polarity.